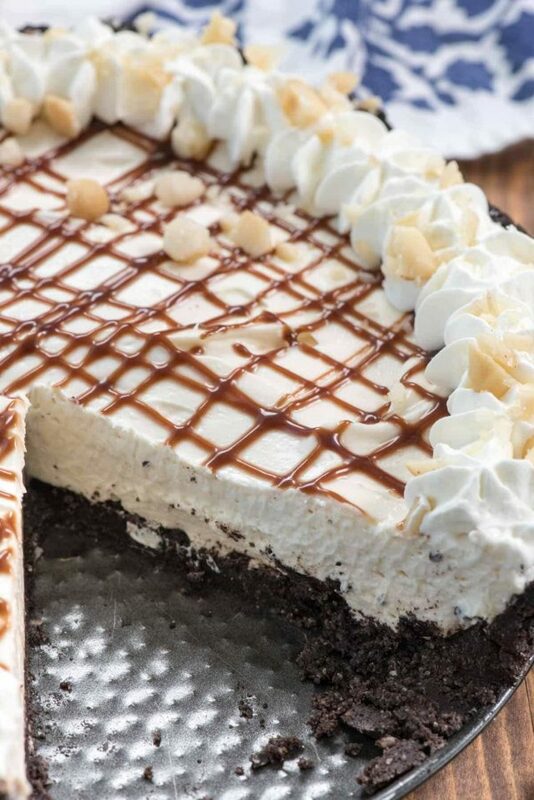 The NO BAKE Cheesecake part of this recipe is perfection but the best part is the CHOCOLATE MACADAMIA NUT CRUST. 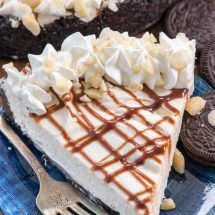 Oreo cookies are chopped with macadamia nuts for the perfect thick and easy crust recipe for the creamy no-bake cheesecake. I have another name for this cheesecake (besides amazing, delicious, the best one ever…etc)…in my head this cheesecake is called Anniversary Cheesecake. That’s because it’s sort of a kind of copycat of the cheesecake Mel and I had at our wedding. We bucked the traditional wedding “cake” and instead had cheesecake. Mel knew a cake maker back when he lived in Half Moon Bay and she made gorgeous and elegant cheesecakes for weddings and parties (and just because). On one of our first dates Mel took me by her shop and she gave me a sample of her macadamia nut crusted cheesecake and I immediately fell in LOVE. Anyway, right after I started this blog I made a copycat cheesecake, aptly named Anniversary Cheesecake, where I gushed about our anniversary and our love and then no one saw it because, hey, it was 2011 and I had, like, 5 followers. Now I look back and cringe because the photos were horrible and the cake had this big crack and I’m like GIRL WHY DID YOU POST THAT? So now, this month, when I was brainstorming ideas for today’s post, I thought I would just remake that and re-post it. But I got to thinking…no one wants to bake a cheesecake in a water bath in July when it’s a bazillion degrees. So I decided to make it a no bake cheesecake. I was going to use shortbread for the crust and then thought…well hey now. 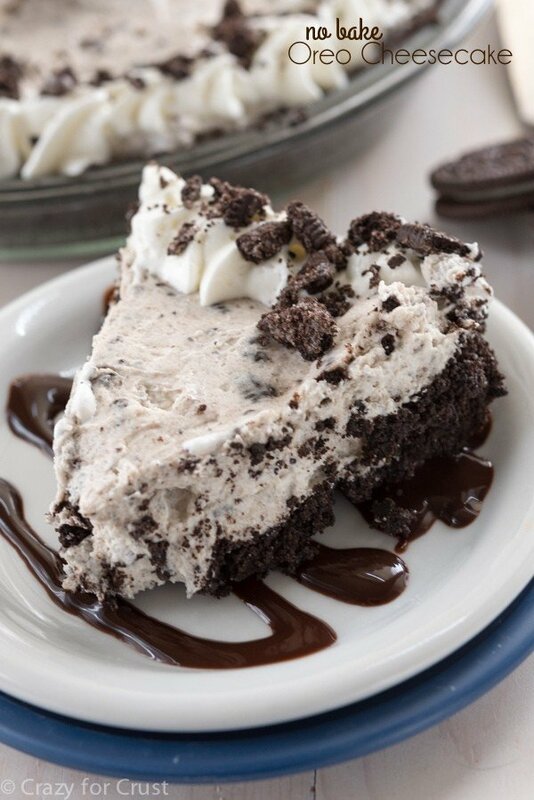 Oreo crust is good. Oreos + macadamia nuts are even better because, hello, chocolate covered macadamia nuts are the best. So instead of remaking and reposting…I’m sharing an INSPIRED recipe…that I actually loved even more. The BEST No-Bake Cheesecakes have a Chocolate Macadamia Nut Crust. I’d like to say we enjoyed this on our anniversary but no. I ate half of it the week before and then had to throw the rest away because it was staring me in the face. It’s that good people: it’s coffee grounds-water-in-the-garbage cheesecake. Dare I say it’s better than the BEST Cheesecake? It is. I should rename that one to the second-best cheesecake because THIS one is the best one. The first layer is the crust and oh boy is it the best crust ever. 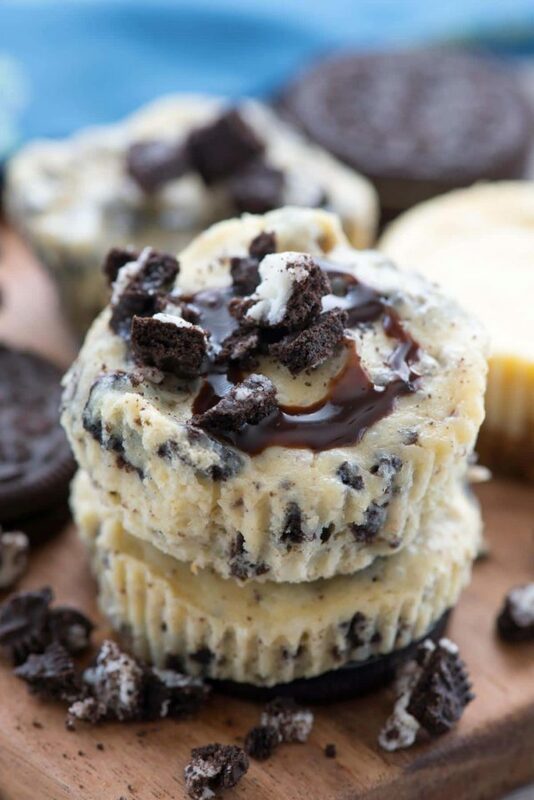 Oreos are ground up with macadamia nuts and mixed with butter and pressed into a springform pan. Just forget the filling, I can eat the crust by itself. Then I remember it’s full of 30 Oreos, almost a stick of butter, and a bunch of macadamia nuts. The cheesecake mixture is made with cream cheese, sugar, and whipped cream. You can use cool whip if you want, but I was out so I used freshly whipped cream. Turned out perfectly, not too sweet, and fluffy as a fluffy no-bake cheesecake should be. Did I tell you I ate half? From the pan? Yes? This is the perfect no-bake cheesecake for any gathering. The crust is the bomb dot comb and would be great with SO MANY fillings. Chocolate Macadamia Nut Crust for the win! If you don’t have a springform pan you can also use a 9-10″ pie plate but it will be really full. You do NOT have to remove the cream from the Oreos before making the crust. Ain’t nobody got time for that. Make sure your cream cheese is room temperature for ease of mixing. The lemon juice doesn’t add lemon flavor, but it gives it a nice brightness to the taste. If you prefer the ease of whipped topping, use one (8 ounce) container. You may want to reduce the sugar to 1/2 cup also, since Cool Whip is sweet. I know macadamia nuts are expensive but worth it. They sell them in the baking aisle, but if you have a Trader Joe’s, go there. They’re cheaper and come in a huge bag. The topping is hot fudge sauce I melted and drizzled, along with extra whipped cream and macadamia nuts. This is the prettiest cheesecake, don’t you think? 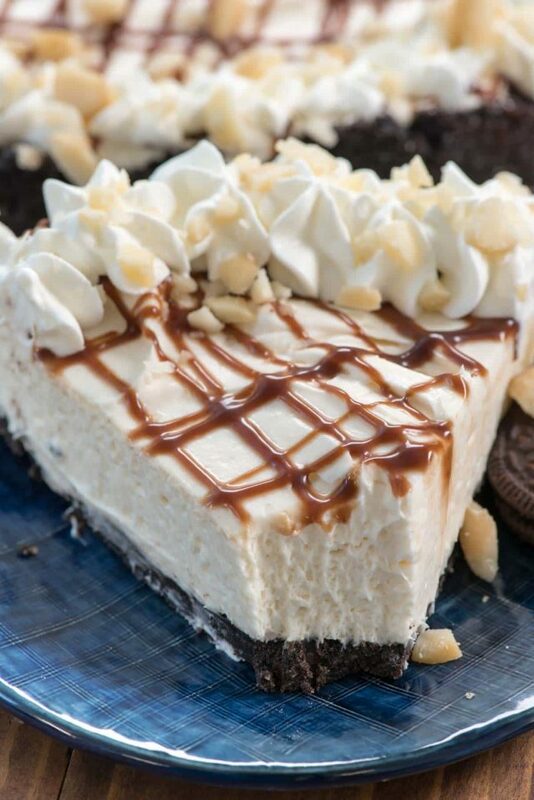 The PERFECT No Bake Cheesecake with Chocolate Macadamia Nut Crust! 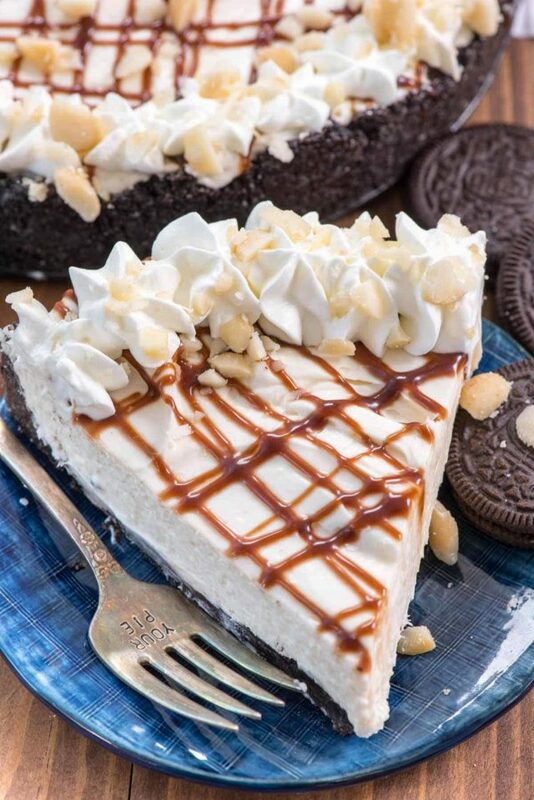 This easy cheesecake recipe is perfect with an oreo crust filled with macadamia nuts. 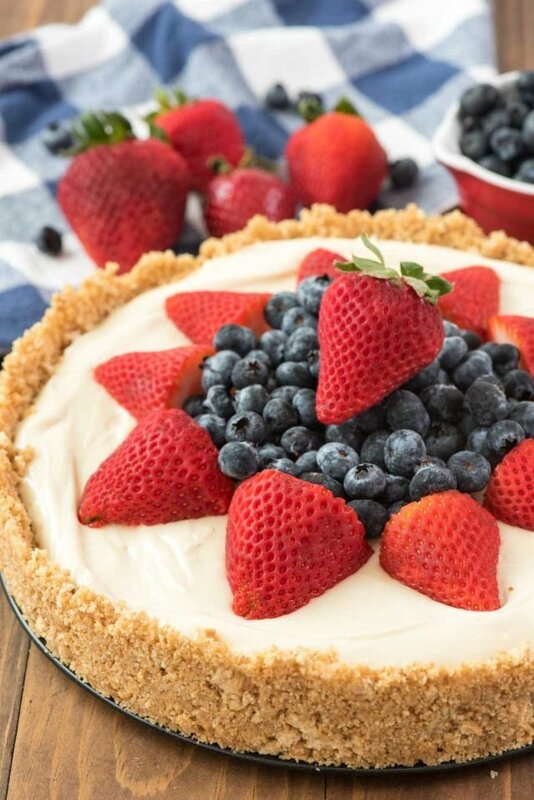 No bake means the perfect for summer recipe! Place cookies and macadamia nuts in a food processor and process until the mixture is a small crumb. You do NOT need to remove the filling from the Oreos! Stir the crumbs into the butter with a fork, then press into the bottom and up the sides of a 9-10” springform pan that’s been sprayed with nonstick cooking spray. Chill crust while preparing filling. Beat cream cheese and sugar with a hand or a stand mixer until smooth. Mix in lemon juice and vanilla. Slowly mix in whipped cream until mixture is smooth without lumps. Spread cheesecake evenly in crust. Chill at least 4 hours or until set. Drizzle with hot fudge sauce, top with whipped cream and more chopped macadamia nuts, if desired. All images and text ©Dorothy Kern for © Crazy for Crust. Please do not use my images without prior permission. If you want to republish this recipe, please re-write the recipe in your own words, or link back to this post for the recipe. Disclaimer: Nutrition information shown is not guaranteed to be accurate. If you love macadamia nuts and cheesecake be sure to check out all of my cheesecake recipes as well as White Chocolate Cheesecake by Taste and Tell, No Bake Lemon Cheesecake by Spend with Pennies, or No Bake Birthday Cake Cheesecake by Life, Love and Sugar. It’s a gorgeous cheesecake and I love that you made it no-bake and that you made it even better than the previous one, and so that it really now is ‘the best’. Happy Anniversary! Following your pics on IG Stories looks like you’re been having the best time and I am so happy for you! And P.S. I would love to see pics of your wedding cake. It sounds like a dream! Happy Anniversary! I wish I could have attended your wedding, but, as I think I mentioned before, I was out of town for my mom’s birthday party. I’m glad that you used an Oreo cookie crust! And no bake, for this unending record-breaking heat wave. Yea, you! I was wondering if the filling can be made into an ice cream? Happy Anniversary 🙂 I wish you both a lifetime of happiness and many many more special anniversaries. What an amazing love story Dorothy, it doesn’t get better than that hey ! Happy Anniversary, and many more happy, healthy years to come! Thanks for sharing your story and your recipe, it looks amazing!